Is the Broken Hubble Telescope Worth Saving? In light of the most recent glitch on the Hubble SpaceTelescope, a serious equipment failure that means the observatory is unable tosend data back to Earth, some are beginning to wonder, is Hubble still worthsaving? The answer, according to many scientists, is yes. The failure of a device called the Side AScience Data Formatter, used to send images and other data from Hubble backto Earth, is a problem, but likely one that can be fixed. The glitch wasannounced Monday by NASA. Engineers now plan to switch the observatory over toa spare "Side B" part currently on board, and perhaps send up areplacement device on the next space shuttle servicing mission, which had beenscheduled for October but now hasbeen delayed to early next year. Though it may sound like one setback too many for the agingobservatory, scientists say Hubble still has a lot of life in it yet. "Of course it's worth upgrading Hubble," saidMario Livio, an astrophysicist at the Space Telescope Science Institute in Baltimore, Md. "The part that failed even has as redundant side to it. If all goeswell, science operations could be up as early as the end of this week. So youshouldn?t worry about that. It's definitely not the end of the world." The now-broken electronics box had been working steadilysince the telescope launched in April 1990. "These things happen. It's been up there in orbit,outside the protective atmosphere of the Earth for 18 years," said HeidiHammel, an astronomer at the Space Science Institute in Boulder, Co. "Glitches happen. It's an incredibly robust instrument. Think about your computers? you don?t still use computers that are 18 years old." Maybe we should give the old scope a break and forgive its failingsnow and then, since it has served us so well for so long, scientists say. In fact, rather than be discouraged by the glitch, some arecelebrating the fact that it occurred now, right before a planned upgrademission. If the malfunction had occurred after the shuttlemission to Hubble, then operations could still be switched over to theredundant part onboard, but that would leave the telescope without a backup ifthat part failed again, or if the spare part didn't work at all. Now, though,scientists have the option of sending up a new device to replace the brokenone, leaving the telescope in a less vulnerable position. "It's probably better it failed now than the week afterthe servicing mission was done, but it does frustrate all of us that werelooking forward to a mission two weeks from now," Hammel said in a phoneinterview. "But I'd rather we?d waited and did it right." The failure is not just costing more time, but also moremoney. For every month NASA delays the shuttle servicing mission, Hubble's costjumps by $10 million to keep ground systems running and a team in place. Buttelescope team members argue that the bloat to Hubble's price tag is nowhereclose to pushing it over the edge of costing more than it's worth. "I don?t see this failure as putting us over the fenceand causing NASA to want to throw up its hands and say, 'Hey, all the hundredsof millions of dollars we've spent on the hardware and readiness for thismission, we're just gonna chuck it, you know, this is just a little too muchfor us,'" Preston Burch, Hubble manager at NASA's Goddard Space FlightCenter in Greenbelt, Md., told reporters at a Monday teleconference. "We'vegot a lot of options here. I don?t see [NASA officials] Ed Weiler and MikeGriffin or myself throwing in the towel because we've got to spend a few moretens of millions to pull thismission off. You know, I think we?re definitely going after this." Since all of the instruments planned to be installed duringthe servicing mission have already been built, and most of the training andpreparations for the upgrade made, calling it off now would be a waste, manyargue. "We've got these new instruments that are ready to go, they'redown there ready to fly," Hammel said. "I think it's absolutelyworthwhile." But some critics have questioned the wisdom of investing inkeeping the aging Hubble going, when we could be spending money to build abrand new telescope to replace it. Hubble has cost a total of about $10 billion over itslifetime, including its past servicing missions, estimated Ed Weiler, associateadministrator of the Science Mission Directorate at NASA Headquarters inWashington, D.C. Its initial cost was about $1.6 billion, he said. Given that the upcoming servicing mission will cost about$900 million, it could be seen as a bargain compared to building and launchinga new observatory from scratch. "The thing about telescopes is that the mirror is themain component," Hammel said. "Once that?s built, you don?t need tobuild new ones, you just need to swap out the instruments. There's nothingwrong with Hubble's mirror. It's great." She compared a telescope with a working mirror to an old carwith a good engine left. It makes more sense to swap out tires and otherelements of the car than to simply buy a new one, since the most importantelement still functions fine. "If at some point, there's a glitch that is notrecoverable, then you're done, but as long as the glitches can be solved andrepaired, it's sort of like an old car ? you don?t want to let it go when it'sstill running," she said. And the upgrades to Hubble aren't coming at a sacrifice tobuilding new telescopes. Plans for the JamesWebb Space Telescope are progressing; the roughly $4.5 billion observatoryis currently slated to launch in 2013. However, that observatory will work inthe infrared range of light, rather than the visible like Hubble, so James Webbisn't really a replacement for Hubble, but a parallel instrument. Ultimately, scientists say the recent glitch doesn't darkenHubble's long-term prospects. 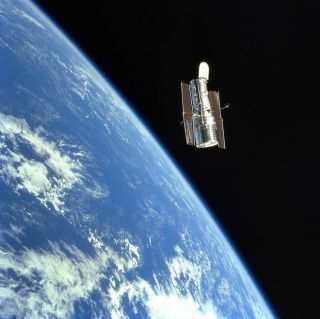 "I have no doubt that that we can service Hubble andmake it into a telescope that will be even better than what Hubble has been sofar," Livio told SPACE.com. "So far Hubble has been this amazingtelescope that really changed all ourviews of the universe. I see the next five years as perhaps being evenbetter than what we've seen." Once the servicing mission has finally been completed,especially if the astronauts are able to install a new Side A Science DataFormatter, Hubble should be in the best shape it's ever been. "If we are going to do this final servicing mission andspend the money involved and launch seven astronauts, we thought it would beproper due diligence if we assured that this mission would leave Hubble with agood solid five- or six- or seven-year future," Weiler said. And, when the day comes that Hubble finally takes its lastpicture, scientists say they will know the whole endeavor had been worth it,because the telescope has already changed our understanding of the cosmos manytimes. "The whole Hubble program has just been a fabuloustestament to the NASA science community and the NASA astronaut community,"Hammel said. "I hope things don?t go wrong but if they do, we just have toaccept that. The Hubble program has been so fantastically successful. It's morethan what anyone expected."